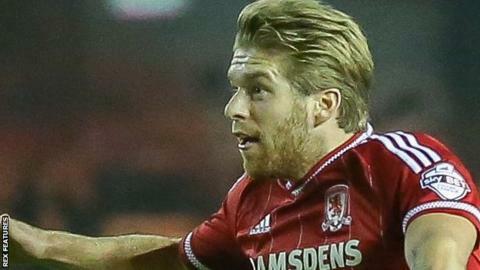 Midfielder Adam Clayton says the financial clout behind Middlesbrough's bid for promotion is not affecting the mentality of the Championship leaders. Burnley's Joey Barton said there was less expectation at his club, who have a smaller budget than some rivals. Boro are two points clear at the top, with fellow big spenders Hull City and Derby County their closest challengers. "I don't think we feel much more pressure than any other side in the division," Clayton told BBC Tees. "I've never been on the pitch thinking how much we pay our players, or anything other than winning the game. "There were probably eight sides who at the start of the season will have wanted to get promotion. "We're one of the top spenders and that might put a bit more pressure on us as a whole club, but as an individual or a team we don't feel that much pressure to do it."